Choosing Roppe means that you are choosing to work with a product partner that has many positive Experiences from within the field to share. When you think of the last job you installed or sold, do you have a positive and satisfying recollection of the vendor that you worked with? When you choose Roppe, you will always finish the project knowing that you partnered with one of the best manufacturers that the commercial flooring industry has to offer! The entire Roppe team works to provide you with the added benefits of innovative products, great customer service, flexible logistics requirements and the industry’s first Single Price Point system! 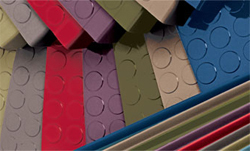 All colors from Black to Pink – one price per product in our major product lines: wall base, tile, treads and accessories. Being the easiest company in the commercial flooring industry to do business with is a long-standing goal for the entire Roppe team. We invite you to share in the Proven. Flooring. Experiences. that make Roppe the partner you want to work with.